Timothy Brown – WHAT IS JAMES WEARING? I am often told that there is a 70’s vibe to my style. I have no doubt that growing up in that decade had a lasting influence on my design aesthetic – I was, and still am, fascinated by the elegance and decadence of the 70’s jet-set lifestyle, and so naturally I incorporate some of that into my look! Here I am on my way to meet with one of my artisans, the very talented Timothy Brown. I had him laquer a client’s entrance hall in an Hermes box orange. – I can’t wait to share some images soon. 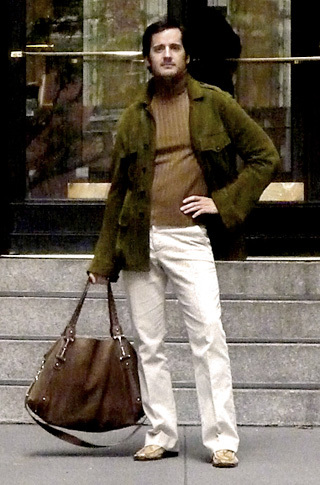 Looking particularly 70’s in a chartreuse green suede safari jacket by Gucci over a camel cotton/silk ribbed turtleneck, oatmeal corduroy pants with python loafers and a brown suede and leather satchel all by Gucci.